Looking for something to do? As a proud member of this community, CAT is pleased to keep you informed about what’s happening. Learn more about the happenings at CAT. Please check back for the latest videos, or visit our YouTube channel. See CAT’s own Patricia Harris-Morehead and Symbosity’s Denise Grabowski take the stage on WTOC’s Mid Morning Live January 11, 2019. They cover topics relating to the CAT Let’s Go! System Redesign Initiative and have a great time thanks to hosts Cyreia Sandlin and Tim Guidera. On January 23, 2019 CAT hosted a webinar to discuss CAT’s Let’s Go! 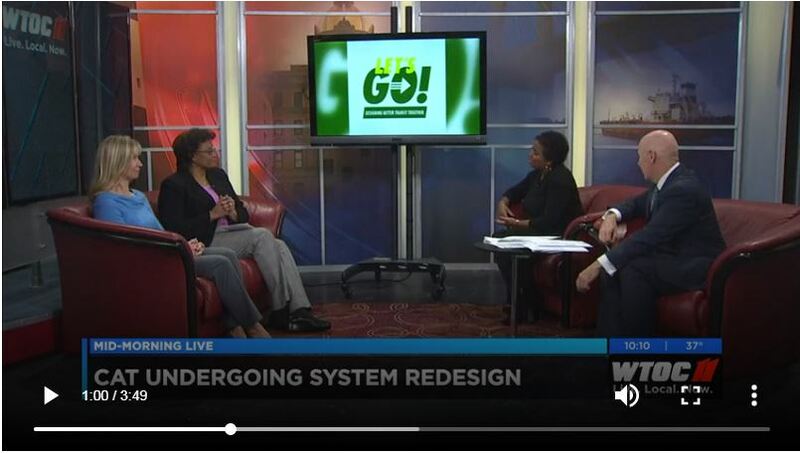 Designing Better Transit Together initiative, which would result in a system-wide redesign of the community’s fixed-route bus network upon completion. In September 2018, CAT announced it would be taking a comprehensive look at our bus routes and examining options for a complete system redesign. In July 2018, CAT welcomed new 35-ft buses to the streets of Chatham County, which were funded through a grant by the State Road and Tollway Authority (SRTA) and the Chatham County Special Local Option Sales Tax (SPLOST). See CAT’s own Ramond Robinson and Patricia Hawkins take the stage on WTOC’s Mid Morning Live July 24, 2013. They cover a variety of topics and have a great time thanks to hosts Jody Chapin and Tim Guidera. Watch WTOC and WSAV news coverage of our groundbreaking ceremony for the long-awaited Downtown Intermodal Transit Center on February 29, 2012. Do You Know About the “dot”? Click on the picture below to watch an informational video about the “dot,” Savannah’s Downtown Fare-Free Transportation System. 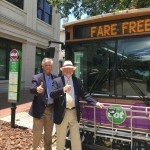 From the shuttle to the streetcar to the ferry, we’ve got downtown Savannah connected…and all fare-free. Visit our Getting Around section of this website or go to the “dot” website to learn even more. Do you remember this psychedelic commercial from 2010? Or how about this jazzy award-winning TV spot? See all these and more on our YouTube channel.